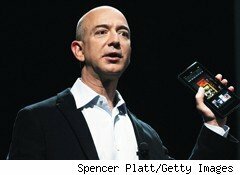 Is Amazon's Jeff Bezos the Next Steve Jobs? There will never be another Steve Jobs. Apple's (AAPL) iconic co-founder is one of a kind. The world's most valuable tech giant will survive without him. Between CEO Tim Cook's operating savvy and chief designer Jonathan Ive's penchant for simplistic gadgetry style, most believe Apple will continue the momentum that's been building over the past few years under Jobs' watch. However, what Apple will miss the most in his absence is Jobs the master marketer. He sold us on the iPod, while our throwback Sony Walkman was collecting dust in the attic. He sold us on iTunes, somehow convincing us that it was better to pay 99 cents for a legal song download than hitting the plethora of peer-to-peer networks for a free pirated copy. He sold us on the iPhone at a time when paying as much as $599 for a smartphone without a physical keypad seemed preposterous. He sold us on the iPad. We snickered at the name and questioned whether we really needed a device to bridge the gap between the smartphone and the laptop. Jobs simply called it "magical" and we asked where to line up. Who is going to tell us what to buy before we realize we want to buy it now? Jeff Bezos may seem like an odd choice to be the next gadget visionary. Amazon.com (AMZN) got its start in the mid-1990s as an online bookseller with the gall to call itself the world's biggest bookstore. Jobs may have the storybook tale of two guys in a garage -- the genesis of some of California's biggest tech giants including Hewlett-Packard (HPQ) and Google (GOOG) -- but Bezos was just a guy on a hard concrete floor, packaging book orders with fellow employees until one of them suggested that Bezos invest in packing tables. However, Amazon isn't just an online retailer. It is a technology company at its chewy center. Its proven platform and patented one-click checkout find third-party retailers of all sizes leaning on Amazon to sell their wares. Jobs played by his own rules and won -- and so has Bezos. Suppliers and rival retailers question why Amazon allows negative customer reviews on product pages, but it's also the reason why shoppers can trust the site. Besides, it's not as if Amazon can't steer visitors to similar products with more positive critiques. Just as Apple has evolved into more than just the computers that defined its purpose on the other side of this millennium, Amazon has evolved into more than an online retailer. Bezos isn't afraid to dream. He was an early advocate for the Segway scooter. He's also invested in public space travel. These are big-ticket items -- hobbies for Bezos, perhaps -- but he has finally taken a bold step in Jobs-ness with the Kindle. Bibliophiles love the way their books feel in their hands. They enjoy stacking a finished read on their bookshelf or passing it along to a friend. Then Amazon, which got its start in 1995 appealing to bookworms, comes along a dozen years later with a device that threatens to push leafy books toward obsolescence. Mainstream audiences didn't want e-readers when Amazon introduced the Kindle during the 2007 holiday shopping season. Outside of Sony (SNE), it was largely obscure companies cranking out electronic book readers. The name certainly didn't help. Kindle -- and now the Kindle Fire -- convey images of kindling firewood in a book burning. However, Bezos went all in with the Kindle. The $399 e-reader was promoted heavily on Amazon's homepage. It was the holidays! Did Bezos know what he was doing by making it harder for shoppers to find the stuff that they actually wanted to buy that season? Several price cuts and generations later, Amazon's Kindle is the undisputed champ in this space. Barnes & Noble's (BKS) Nook is the distant silver medalist with only a quarter of the market. Now that the Kindle can be had for as little as $79 it will be tough to topple. Then we have the Kindle Fire, Amazon's $199 touchscreen tablet that does more than just read books. Apple's iPad has easily deflected rival tablet makers, but it has never faced a company this big selling a tablet at a price this low. In an ideal world, Kindle Fire doesn't eat into Apple's business as much as it expands the market of tablet owners. Folks who have flinched at Apple's $499 entry-level price for a nonessential gadget may make the plunge at $199. It also only helps that Amazon has 12,000 video titles available at no extra cost to existing Amazon Prime members. Bezos won't be crowned tech's next visionary overnight. The market's reaction to this week's report -- pounding the shares because Bezos is valuing market penetration more than margin expansion -- shows that Wall Street isn't ready to trust his gambles. However, Bezos was able to sell millions of Kindles to this same skeptical market, and preorders for next month's Kindle Fire appear to also be in the millions. Bezos knows what we want before we know we want it -- and that's the biggest Jobs-esque compliment that one can ever receive. Longtime Motley Fool contributor Rick Munarriz does not own shares in any stocks in this article, except for HP. The Motley Fool owns shares of Apple and Google. Motley Fool newsletter services have recommended buying shares of Amazon.com, Google, and Apple. Motley Fool newsletter services have recommended creating a bull call spread position in Apple.